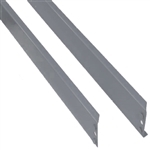 Penco Double Rivet Angle Beams 48-96"
Our rivet shelf beams are designed to provide maximum storage capacity while minimizing the loss of usable vertical space between shelves. These beams can be used to add levels to an existing rivet shelving unit or to create your own shelving unit. Beams are available in tan and grey, but we can also create custom colors of desired. Contact us for details. Double Rivet Angle beam (Heavy Duty): Lengths of 48" and up provide stability and increased load capacity in the longer lengths. Double Rivet Angle beam (Standard Duty): Lengths of 42" or less are used to establish unit stability and to provide shelf support on all four sides. Single Rivet Shelf beam (Standard Duty): Primarily used as an intermediate shelf support when maximum vertical space between levels is needed. Furnished as standard on High Density Shelving units.